Hanson Grant, 21,will discuss his startup, Think-Board, at the Southern New England Entrepreneurs Forum (SNEEF), on Thursday, Feb. 11, 5:30-8:00 p.m., Center for Innovation and Entrepreneurship (previously Advanced Technology and Manufacturing Center), 151 Martine Street, Fall River. 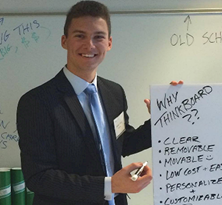 Grant launched Think-Board in his Babson College dorm room after finding paper too small, white boards too expensive, and dry erase boards too bulky. Think-Board is a clear, reusable, removable vinyl adhesive film that parents, kids, college students, or office workers can use on a desk, wall, table, refrigerator, or any other smooth surface, with nails or drilling. It enables anyone to brainstorm, solve math problems, write poetry, develop ideas for stories, make a list, or draw on your desk, wall or refrigerator. For kids, it’s not vandalism – it’s creative learning! Grant has sold 10,000+ units in 29 countries worldwide and was a Mass. Challenge finalist. Think Board was featured last August on the Today Show and last October in the Business Plan column of the Boston Sunday Globe. The SNEEF event is open to public. Admission $20, SNEEF Affiliate member $15, SNEEF Members free. Pizza and salad dinner. Join SNEEF for $75 and attend free.